Here you can buy both of the Volumes in this set at a discounted price!! 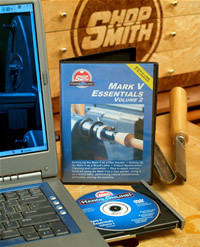 If you’ve been wondering whether or not the Shopsmith MARK V Multipurpose Woodworking System is for you…or have just purchased or inherited a new or used machine and would like to see it put through its paces…this great Nick Engler hosted CD / DVD is most definitely for you. including the different blades that are available; how to mount them; positioning the Worktable; making vital adjustments; using safety devices; and working with the Miter Gauge, Rip Fence and optional CrosscutSliding Table. including raising the machine into vertical position; adjusting the Worktable for drilling; installing the Drill Chuck and bits properly; using the Rip Fence and Miter Gauge for controlling the workpiece and performing repetitive operations; setting the Depth Stop; adjusting the speed and using the Telescoping Legs for added workpiece support. including adjusting the Worktable height; using the Rip Fence as a backstop; adjusting the Depth Stop and using the Miter Gauge to ensure perpendicularity. with both our standard Flat and our optional Conical sanding discs. He’ll discuss using the Flat Disc at the center of the MARK V Worktable, as well as at the outside edge for both straight and convex edge sanding and how the Lower Saw Guard can be used to keep shop dust at a minimum. He’ll also introduce you to our amazing Conical Disc and the unique operations that only it can perform. including how to set the MARK V up in Lathe mode, align its components for the best results and mount the workpiece properly. including cleaning & lubricating the Headstock & locks; Quill; Speed Dial; Worktable & Cariage; Way Tubes; Extension Tubes & locks; Miter Gauge; Rip Fence; Saw Guard; and Lathe Tool Rests & Posts.